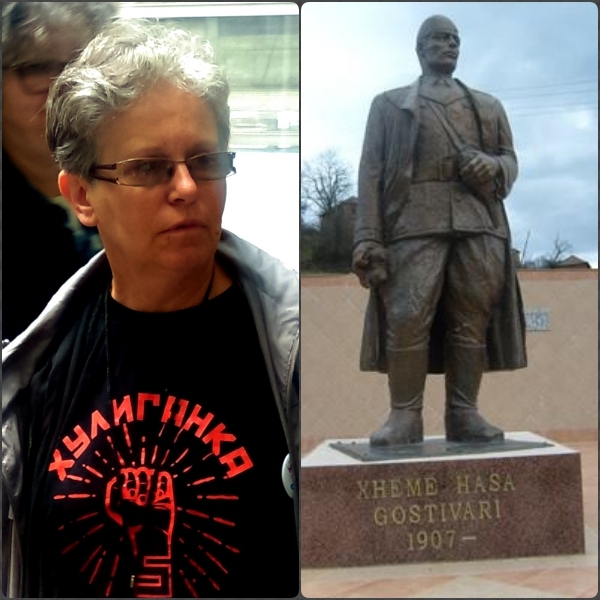 NAJCHEVSKA: NO COMMENT ON ALBANIAN NAZI STATUES – Alternate Comms. Ms Mirjana Najchevka, a leading pro West academic in Macedonia who supports name change for that country, has refused to comment on controversial World War II Albanian Nazi collaborator statues – in particular one of quisling commander Xhem Hasa Gostivari -built in Macedonia by Albanian politicians post 2001 war, saying that such a question and others posed to her were tendentious and full of untruths and half-truths. Her comment runs counter to respected British academics such as Oxford University professor James Pettifer and other UK experts Roderick Baily and Owen Pearson who have confirmed- citing British military wartime accounts- that Gostivari was an Albanian Nazi collaborator. Albanian Nazi statues in Macedonia remain a touchy subject with both the EU and US who avoid the subject as the Albanian politicial bloc is seen as a trusted political client of the West, especially in ramming through name change of Macedonia to satisfy Greek and Bulgarian nationalist demands. Both are NATO and EU members and staunch allies of the US. Ms Najchevska belongs to the Institute for Sociological, Political and Juridical research at University “St. Cyril and Methodius” University Center for Human Rights and Conflict Resolution, in Skopje, the capital of Macedonia. She was also asked questions about the Prespa and the Bulgarian Good Neighbourly Agreements signed by Macedonia with Greece and Bulgaria respectively – which will see Macedonia change its name and lose its identity in return for possible NATO and EU membership; her human rights credentials queried in particular no details about her pre 1991 activities during Macedonia’s membership of the Yugoslav federation and no record of her ever protesting against Serb nationalism. 1. Do you support or oppose the World War II Albanian Nazi statue of Xhem Hasa Gostivari built by Albanian politicians in Macedonia in 2006? 2. In Germany, it is illegal to build Nazi statues. Should Albanian Nazi statues be banned in Macedonia? 3. Many Macedonians see both the Prespa Agreement and the Bulgarian Good neighbourly Agreement as racist – discriminating against Macedonians. Why do you support both? 4. Before 1991 in Socialist Yugoslavia there is no record of you ever taking part in any human rights activism. Could you explain why? “No, I do not intend to answer the questions asked, because they are tendentious, one-way, and full of prejudice. The questions themselves contain a very large number of untruths and half-truths which in themselves require a complex explanation that covers in many areas. In the law this is called probatio diabolica, or, devil proving that I really do not intend to get involved. I hope you will not contact me anymore.,” she said. Ms Najchevska was initially contacted by telephone. She requested that any media questions be put to her via email, which was complied with. Мислам дека многу пристојно замолив да не ме контактирате. Немам намера да давам никакви податоци и да одговарам на никакви прашања. Секој следен котакт ќе го сметам за вознемирување. The questions are highly appropriate and accurate – Xhem Hasa Gostivari, according to World War II British military accounts – cited by leading British academics such as Oxford University Professor James Pettifer and others – was a Nazi collaborator. There is no historical dispute over the evidence offered about Xhem Hasa Gostivari. Moreover, Nazi statues are banned in Germany by law. These are facts. As for the other questions – they are also accurate and need to be asked, especially if someone claims to be a human rights activist and their history needs to be examined. There is no mention in any of the Amnesty International records or Yugoslav state archives of you before 1991 being a human rights activist. Therefore it is highly appropriate to ask you about your history. I’ve checked the newspaper archives of Macedonia, the US, UK, Australia and there is simply no mention of you ever protesting outside the Serb Embassy in Skopje, Macedonia against Serb nationalism. If this is not correct can you please supply me with details of your protests against Serb nationalism. Не, немам намера да одговорам на поставените прашања, заради тоа што се тенденциозни, еднонасочни и полни со предрасуди. Во самите прашања се содржани многу голем број невистини и полувистини кои сами по себе бараат комплексно објаснување кое задира во голем број области. Во правото ова се нарекува probatio diabolica, или, ѓаволско докажување во кое што навистина немам намера да се впуштам. Се надевам дека нема веќе да ме контактирате. I will ask you again – do you support the Albanian Nazi statues in Macedonia? Јас пак мислев дека имам работа со новинар. 3. Many Macedonians see both the Prespa Agreement and the Bulgarian Goodneighbourly Agreement as racist – discriminating against Macedonians. Why do you support both?